After exiting the humid tropics of Asia this March, I stepped into Europe’s spring time in full bloom…and it was love at first sight. Welcome to Costa Brava, Spain! And boy was it tiring…. 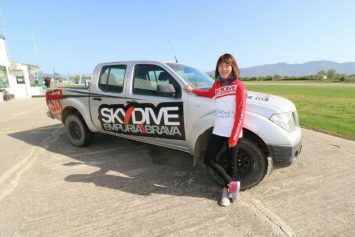 And that’s where we lose all sense and went SkyDiving at Empuriabrava! Before this highly anticipated road trip, I have heard ravings from my avid European friends about the breathtaking and rugged wild beauty of Costa Brava coastal views and rock formations. From yacht trips to the crystal clear water to adventurous rocky activities, it seemed to be the perfect place for an outdoor lover like me. So when I arrived all the way from Singapore, it was definitely with great anticipation to get into the heart of the outdoor action. 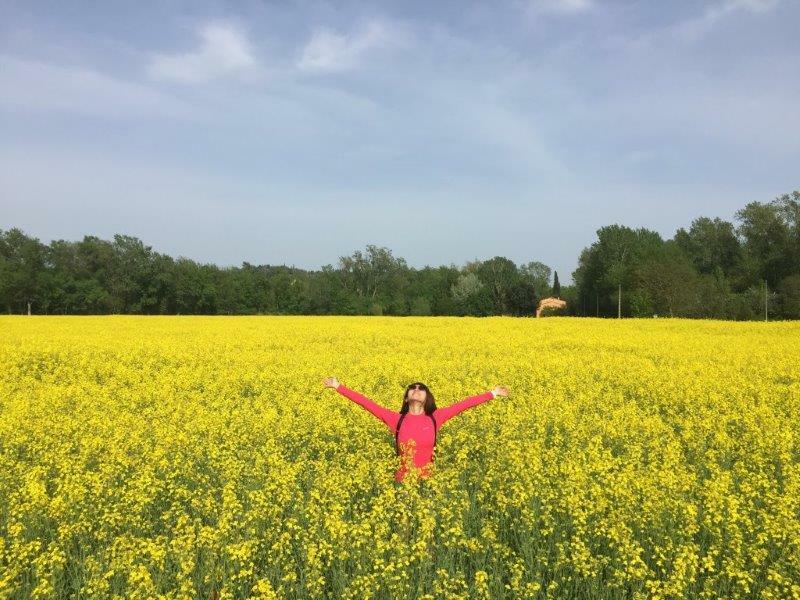 But I didn’t expect to be blown away in delight by the fields of bloom as we drove from Barcelona towards the plains of Costa Brava. We arrived at Girona in the late afternoon about 2 hours later and was greeted by the beautiful rows of spanish architecturally design houses along the Onyar River, each house painted in the iconic hules of orange, brown and beige with a little catalonia drapped over the grill/ window here and there. The memories of my last time in Spain all came flooding back and I could only smile in fondness. We were lucky to experience a very interesting little festival/event in Catalonia call ‘Saint George’s Day”. 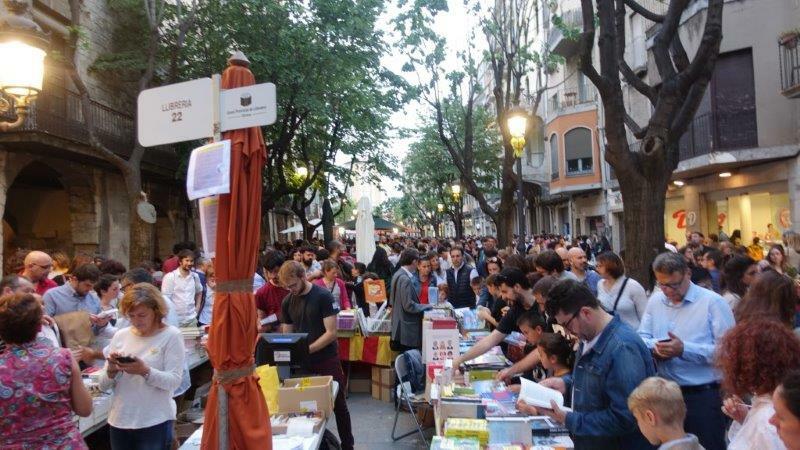 Every year on April 23rd, the streets and towns of cities are lined with shops selling books and roses. On this special day, where the men give the ladies in their lives (lover/ mum) a rose, and the women in return give the man back a book ( no issues getting books for women too, am all for reading more, but how can I say no to another rose;) ). 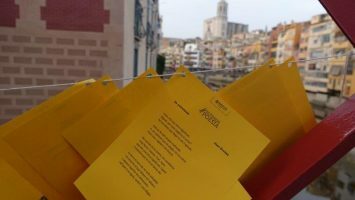 This unique day is meant to celebrate a patron saint in Catalonia who perpetuated this tradition base on love and culture. Cez and I walked the streets of Girona during sunset and checked out the bustling festive spirit and crowds. 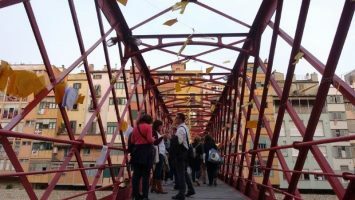 It was mad crowded and every soul in Girona seems to be on the street. 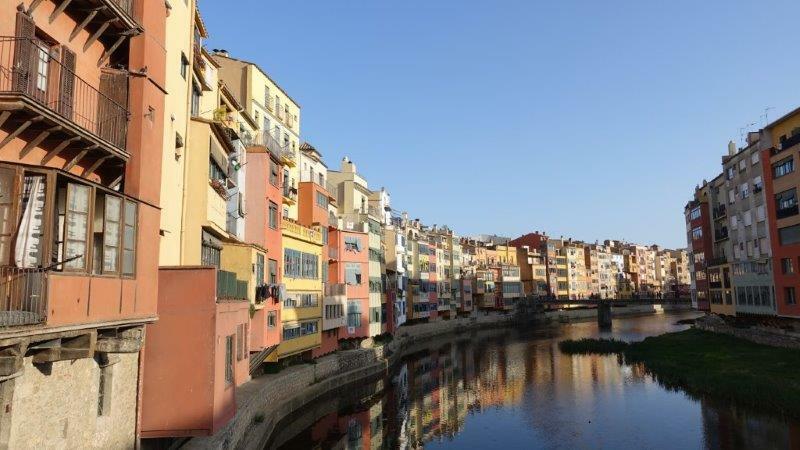 We obviously took the time to also see a bit of Girona town, its bustling street/ tapas life, romantic Onyar River and yummy ice-cream shops. 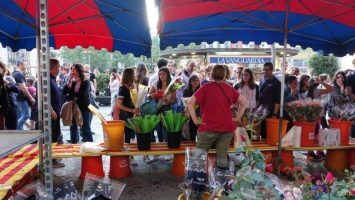 Camprodon – If you have some time to spare on the road, do swing by this little town and immerse in the rich history and culture of this place. Okay, enough of sightseeing and towns for now, time to hit the outdoors…. 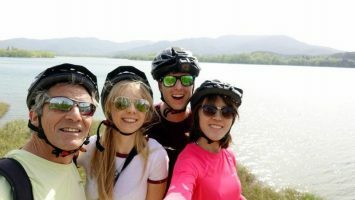 We kickstarted our series of outdoor adventures at Costa Brava with our 1st pitstop – Banyoles Lake. This pretty calm lake, is also the biggest natural lake in Catalunya, and is especially popular during summer periods as training grounds for rowing pratices, and attracts professional rowers from UK and around Europe to train here. While we were there this spring, we didn’t spot any rowers but there was a section for people to swim laps and sunbathe. We on the other hand, had a more interesting activity prepared for us – kayaking in the crystal clear lake ! 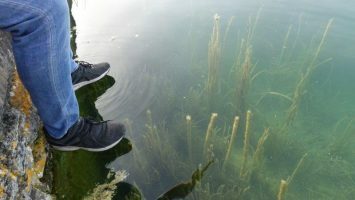 Try to spot the marine life beneath while you kayak along the edges of the lake, and don’t forget to also spot the little castles when you turn around the bends of the lake. 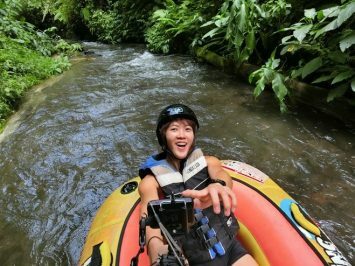 For those who are not as big a fan of water activities, the next activity we did was an equally fun option to see the lake – go around it on wheels. This was really enjoyable, given it was such good weather and I wanted some good leg exercise while having a close up look of the flowers fields. We returned our kayaks and progressed to bikes, all rented to us from Caiac i Natura. 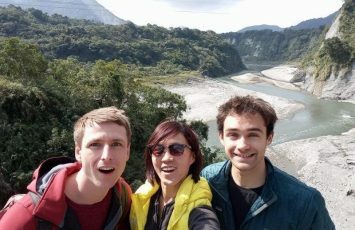 Our awesome guide Atilio brought us around to all the best spots – to capture the best photos of the lake and surrounding yellow fields. 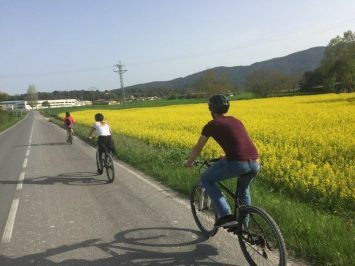 Cycling past the yellow golden flower fields with our helmets and powerful mountain bikes. Whiz past the fields and forests along the way. Watch out for the cars when you are on the roads! Highly recommended to go cycling after either in the morning or later part of the afternoon when it is not so hot and the sunset skies start to show, giving a nice reflection off the lake. We had a full day of workout and retired to our cosy Girorooms apartment back in Girona town. 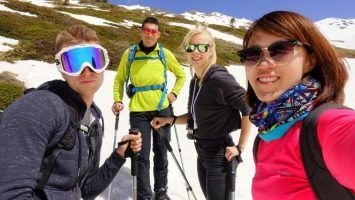 Snow shoeing for the 1st time in the majestic Pyrenees mountains lead by our incredible guide Damià from Oxineu Sports and Recreation Centre. 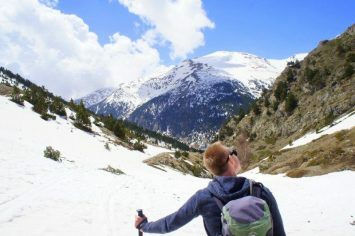 Water is easy, but now we have transited to the icy slopes in the Pyrenees. 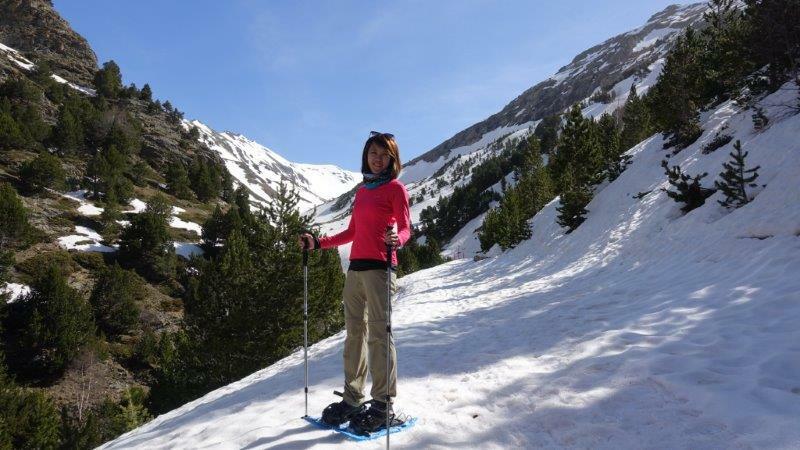 After fastening blue plastic net-looking devices below our shoes..called snowshoes..we were off to do our 1st snow shoeing in Vall De Nuria, Pyrenees with Oxineu Sports and Recreation Centre. Looking very pleased with my snowshoes. As you can see, I am only in 1 thin long sleeve thermal layer as you will work out quite a sweat along the way( For those wondering what is good to wear for hiking in cold places, my top is Columbia brand, very good for insulation in winter conditions). The sun and hiking in these snow and cold conditions will strain you after a while and its better not to overdress or under. This particular trail (Vall de Nuria to Puigmal at 2.913m) will take about 4.5 hours if you go on a slow but progressive pace. We stopped in between at a nice rocky patch to munch the sandwich lunch that was prepared for us, before continuing on our journey..good workout indeed and stunning mountain views all around. Little note before the hike: Do not overlayer or underlayer ( find clothes that are insulated and protects you from the wind yet breathable. One should also put sunscreen in advance and a pair of shades, as the sun rays are strong and reflect off the ground. 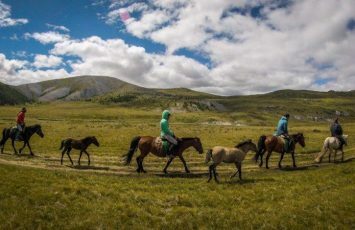 For those who love animals, you will see some lovely mountain wildlife along the way, especially if it is after winter and they are all awake from hibernation. 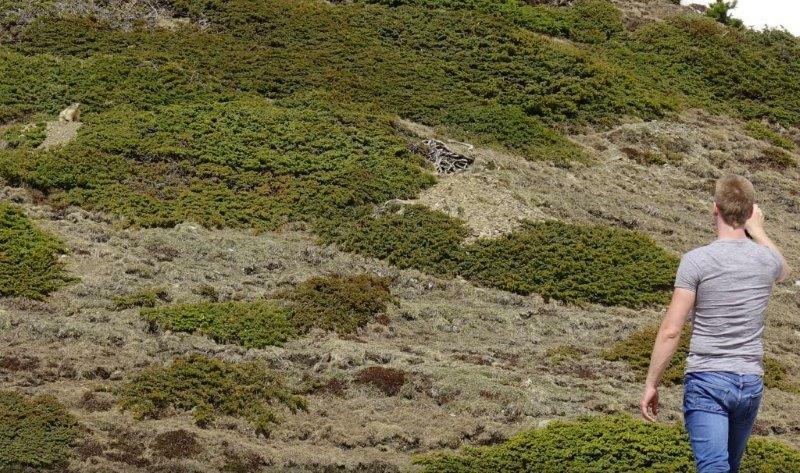 You can look out for animals like deer, large lizards and my all time favourite…the fluffy brown Marmot! We saw one really adorable marmot from afar, which was calling out in a perculiar ‘parrot sounding’ voice while perched on a rock. Utterly adorable little animal which I wished allowed me to get upclose to it and pet it. 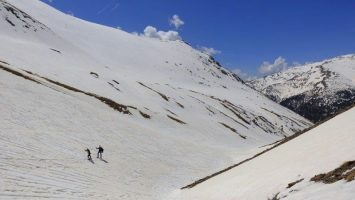 Concluding this little winter hiking adventure we had at the majestic Pyrenees for a day, known throughout Europe to be a great destination for skiing in winter, hiking, parasailing and more in the other seasons. Train/ Rail: We came from Ribes Vila Station and arrived at Vall de Nuria in half an hour, with a scenic view of waterfalls, mountains, river rapids and more. Last but not least, we keep the best for last. After we conquered the Lake Banyoles (liquid), ice in the Pyrenees ( solid), we are only missing the final and last state of matter.. Fly through the skies..and witness the beauty of Costa Brava from a bird’s eye view! This once in a lifetime experience, is truly memorable for those who like me..love action packed activities. 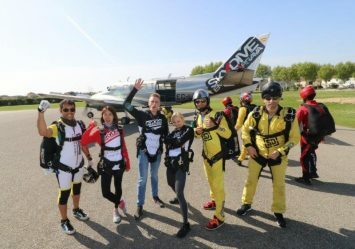 This is my 2nd time skydiving, but I still had such a good time nonetheless ( one can never get enough of flying like a bird). Witness the sheer beauty of the snow-capped Pyrenees and iconic Costa Brava rocky coasts while you fly through the sky at high gravitational speed. 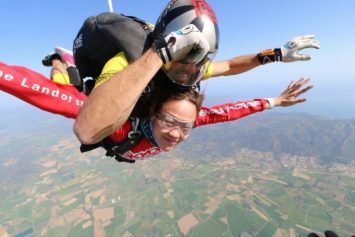 SkyDive memories in Costa Brava. Don’t mess with the pros! Concluding the water, land and sky experiences here in beautiful Costa Brava, ( in Spanish known asˈkosta ˈβɾaβa). 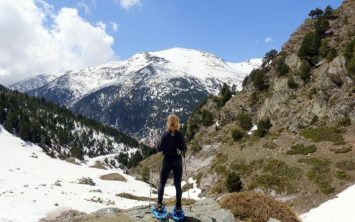 This list of crazy outdoor adventures in this road trip are not conclusive but are in my opinion one of the best set of activities to embark on in Costa Brava. Stay tuned for more about our rocky misadventures and Via Ferrata action ( my personal highlight in my trip) here in sunny Costa Brava. Are you convinced to come visit the wild coasts of Costa Brava? Your Costa Brava trip sounds just too amazing! Love the festival of exchanging roses and books. 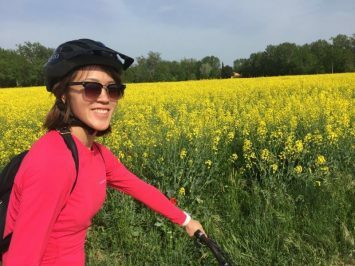 🙂 And yes, bicycling through the lovely yellow carpet of flowers would be totally my kind of activity! Great post Lydia! 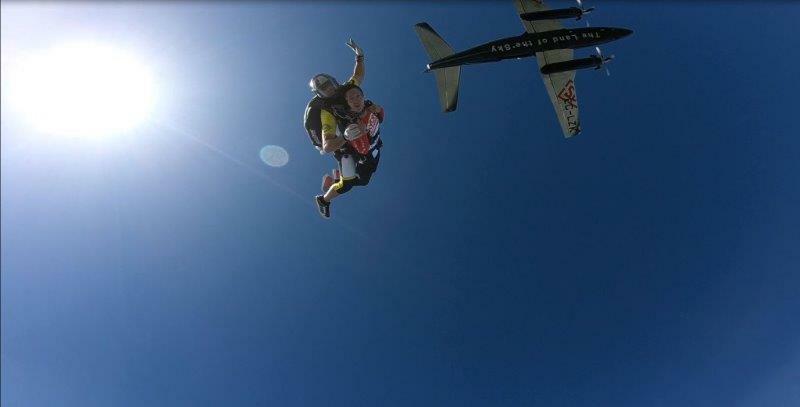 Love skydiving. We hope to get to Costa Brava soon! Those fields are so beautiful! And skydiving looks super terrifying but also really fun! 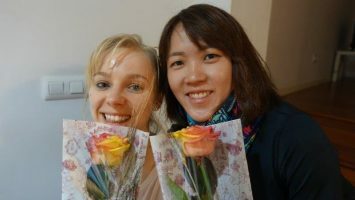 Thank you a lot, Kelly! 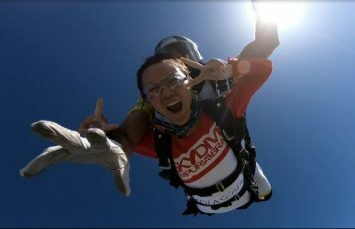 Skydiving is extremely fun and definitely worth doing, that feeling can’t be explained in words! 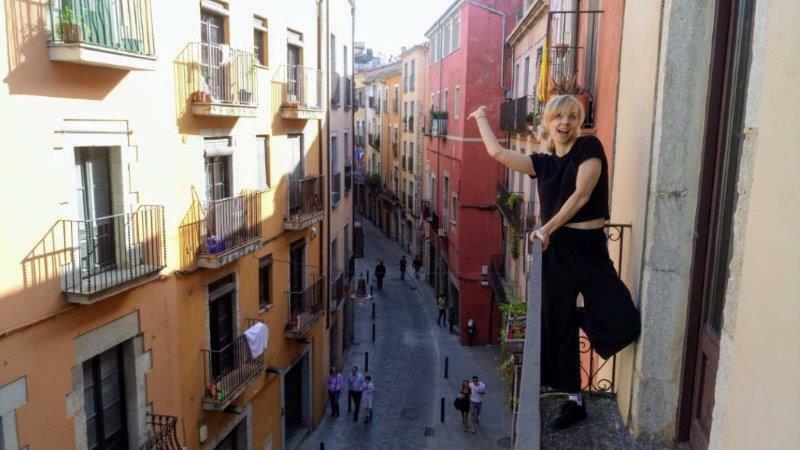 Love the Costa Brava – in particular the town of Figueres and the Dali Museum. 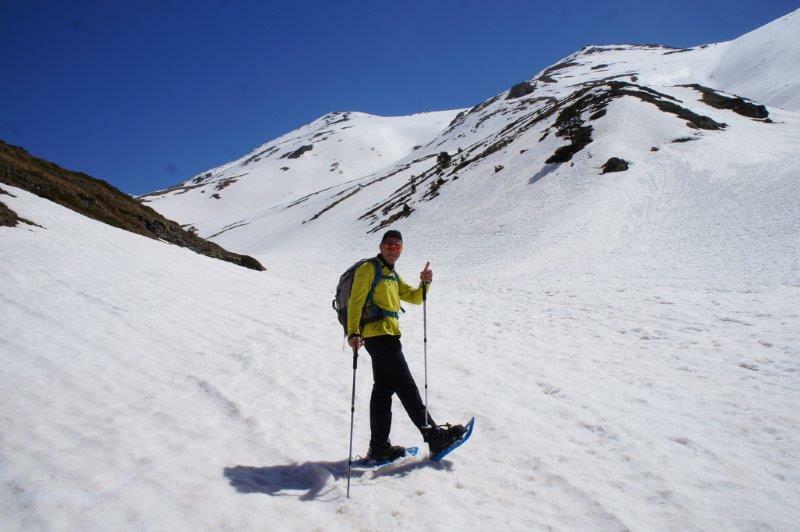 Never been snowshoeing though, looks great fun and quite challenging!